This post is a little different, it is my contribution to an English mule blog. 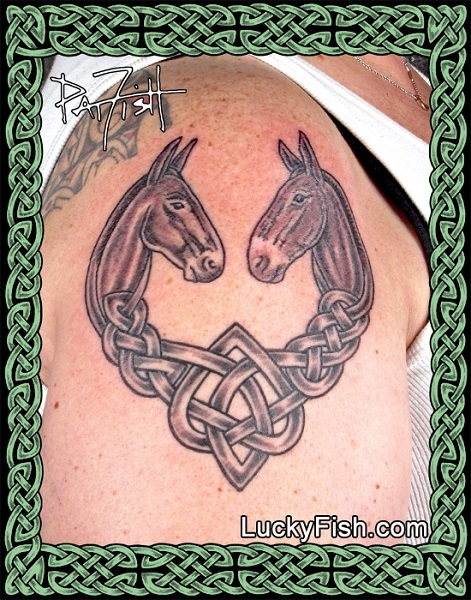 A bit of a departure from the usual trail report, this is the story of Tobe & I.
Pat is an extremely talented tattoo artist and a mule rider, who blogs about her muleback adventures here. What a fantastic combination! 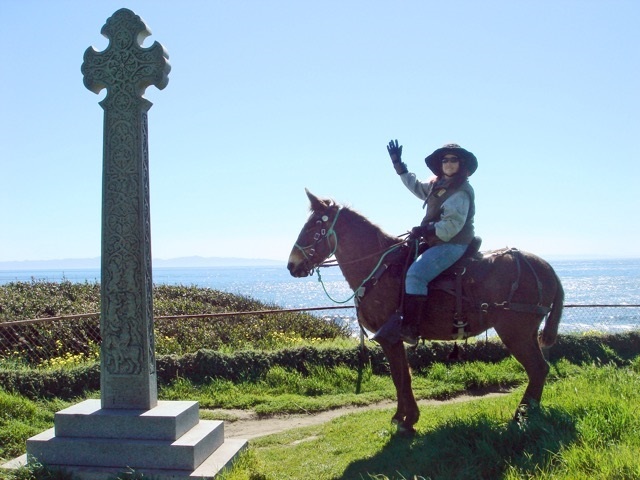 I would thoroughly recommend checking her blog out, as it is wonderfully written and takes you along some great trails. She very kindly agreed to talk to me about her gorgeous mule, Tobe. 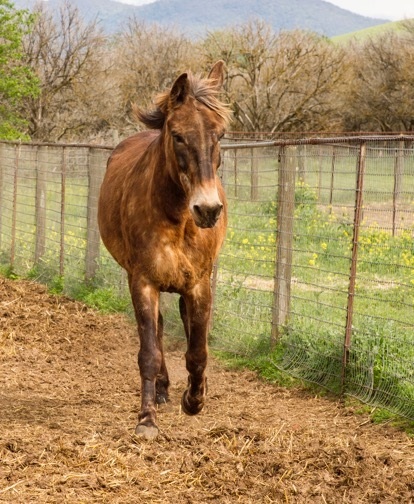 Tobe is a gaited 18 year old 16hh mule bred from a Rocky Mountain mare and a Spanish jack. He’s chocolate brown and in the winter is dappled but sheds out much darker in summer. 2. How did you meet him? I knew I wanted a gaited mule, and there were few for sale in California. So I went to Kentucky where there was an auction at Murray State University offering 120+ mules, a dozen of which were gaited. I bought him there and had him shipped back to California. 3. What do you do with him, and what are your plans for the future? We trail ride, and I archive many of our adventures in this blog : www.muletrail.com. 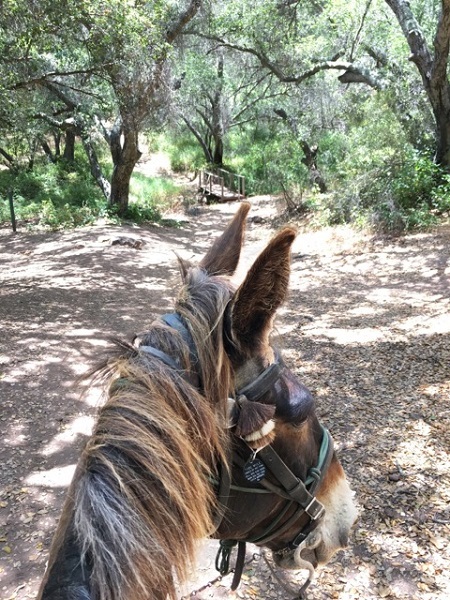 I participate in many group rides that give me the opportunity to explore Southern California, particularly the front country trails where having a sure-footed mule is far superior to having a horse. We also get to ride on some of the historic ranches, seeing privately owned areas where human impact is minimal. Sometimes we do endurance rides, this is us [above, right] on a 25 mile NATRC ride. And I like to participate in parades. This is us [below] in the local Fiesta Parade, a very big celebration every August that has the largest equestrian parade in the United States. I go as a nun, and since mules were the traditional mounts of the religious in the Middle Ages it is appropriate that he is my mount. 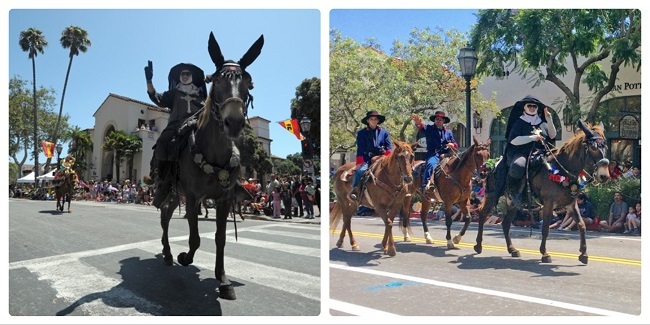 Last year in the parade I was escorted by two men dressed as Soldados, the soldiers who escorted Father Junipero Serra as he traveled up the West Coast establishing the missions. He was well trained when I got him, and I was not, so it has been a journey figuring out how to communicate. We get along well, with his only vice being an opinion, often warranted, that his sensory perceptions give him a superior awareness. I work hard at acknowledging his alerts to danger, so that he feels we will be facing that unknown threat as a team. So he communicates to me in a nonverbal way that he is sensing something he’s unsure about, and my job is to be paying attention, let him know I am under advisement, and then sit deep in the saddle in case I have to ride a reaction. As a result he very seldom spooks, and if the threat turns out to be an off-leash aggressive dog we actively chase them and turn the tables, becoming the predator. With him as my mode of transport I have been able to explore and experience so many places in the natural world that I would never be able to hike to on my own feet. I am deeply grateful for his presence in my life, and anticipate many more years together. I had a horse first for a year, and I couldn’t reconcile with the fact that they are always afraid, that they are the ultimate prey animal. I believe that the rational donkey side of a mule’s brain gives them the opportunity to chose between fight or flight, and the time delay while they size up a situation gives me time to get ready for a reaction. I respect that, and work to make the line of communication open and to truly be a Mule Team. 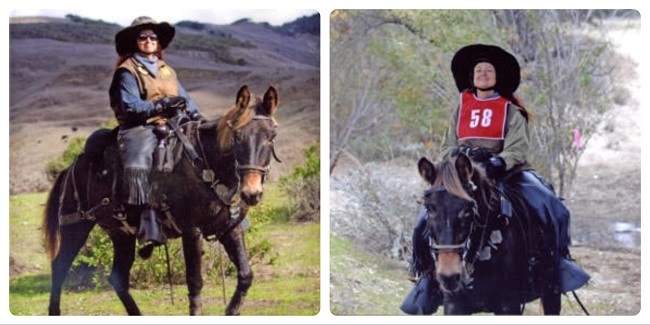 But for someone considering getting a mule, fair warning that horse owners will have a lot of opinions about mules. I just play dumb. I say I’m not that experienced a rider, so I need to ride a smarter animal. And any time I watch someone dealing with a panicked, reluctant, or disobedient horse, I try always to preface my advice or commentary with “If it were a mule, we would…..” which usually gives them an opportunity to tell me how much that particular training technique would fail with a horse. So then I just watch, and thank Tobe for being a level-headed hard-headed lunk who will always have the strongest intelligent sense for self-preservation, so my job is to hang on and enjoy the ride.